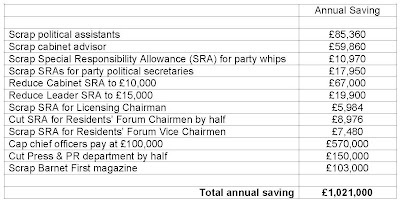 Regular readers of Barnet Council Watch will know that Cllr Lynne Hillan is proposing to save £950,000 a year by slashing the resident warden service. This will have a devastating affect on some of the most vulnerable members of society living in sheltered accommodation. One of the questions invites residents to give alternative suggestions as to how the council can make the required savings. These are my suggestions based on financial information provided in various council reports. I support this council’s desire to cut waste and bureaucracy - but not at the expense of our elderly residents. Please note that the closing date for the on-line consultation is 5pm on 31st March 2009.